Peter Stöger went from casualty at FC Köln to Dortmund's sideline: how is he moulding the Black and Yellows? Despite a draw at Schalke, FC Köln parted ways with their manager Peter Stöger following a poor start to the season. FC Köln’s turned to Stefan Ruthenbeck, former U-19 coach who took the job until the winter break at least, trying to revitalize a team sitting at the bottom of Bundesliga with no wins and only three points coming from three draws. Stöger paid for a team who has been balanced on its deficiencies, if you could say it, as Köln currently have the worst defence – allowing 27 – as well as the worst Bundesliga’s offence – just 6 goals scored so far. Their expected goals difference (xGD is a differential between for and against expected goals which can give us an idea on Köln’s defensive efficiency this season) in open play was -6.50 with their xGA at 19.41. Stöger’s side total xGA was 29.04, the worst of any Bundesliga team. These stats raised questions about the Austrian’s defensive approach despite Stöger’s strong reputation for defence, built on FC Köln conceding just 20 goals out from 34 games in his first season at the helm of a side that were promoted from the Bundesliga 2 as division champions. Centre-back Neven Subotic’s finished loan spell had an effect on the team’s defensive downfall. On the offensive side, Köln registered an average of 13 shots per game, eighth best in Bundesliga, but just 3.6 were on target – better than just Freiburg. These stats highlight Köln’s troubles up front. It’s barely a surprise considering that Stöger’s team lost Anthony Modeste, their best goal scorer last season, to Tianjin Quanjian. Colombian forward Jhon Cordoba, who was brought on from Mainz to replace Modeste, played pretty well but wasn’t able to replicate the Frenchman’s performances in front of the net. Japanese forward Yuya Osako too wasn’t a scoring threat having scored just 3 goals so far: not surprising for a striker who had never scored more than seven goals in his Bundesliga career. The 39-year-old veteran free transfer Claudio Pizarro – another pick brought on to try to solve team’s goalscoring illness – couldn’t help. Another problem surfaced over there was due to the overall FC Köln approach. In fact, Stöger’s side often tried to rely on counterattacking play. It became a hard game plan to follow when the Billy Goats faced – as it happened – teams not so desperate for a win as them. In these games, the opposite sides didn’t push heavily forwards so there were not spaces behind their defensive line to be exploited by Cordoba & Co. So, to put emphasis on solid defence and defensive compactness alone, in must-win games, can be counterproductive. Nothing new about Stöger’s approach from last season when the Billy Goats deployed a much defensive-oriented style supported by a basic wing play. Concerns for the lack of a more organized offensive structure were still there. The big difference has been the presence of a scoring threat as Modesto up top and the fact this season FC Köln were plagued a large number of poor decision-makings. It contributed to FC Köln’s current crisis. So, at the end, Köln’s dismission of Stöger is hardly a surprise after their tough start of this Bundesliga campaign. This is especially true for a club that have a reputation for abruptly sacking managers, although the Austrian coach began his fifth season in charge of the team. That’s a huge blow for a coach who has been linked to Borussia Dortmund no later than last summer when Stöger’s name joined Nice coach Lucien Favre, Julian Nagelsmann of Hoffenheim and Frankfurt’s Niko Kovac as a candidate to succeed the departing Thomas Tuchel at the Westfalenstadion. The 51-year-old Stöger’s tactics came under scrutiny from the start of the season with the team’s switch between various systems that didn’t work: FC Köln have mainly switched between a 4-4-2 and a 4-2-3-1 formation this season but Stöger also lined up a three-man backline out from 3-4-3 and 3-5-2 patterns. The search for Stöger’s successor seemed to have Markus Anfang as the frontrunner. The FC Köln native appeared as the club’s favourite candidate due to the remarkable work he’s doing with Bundesliga 2 leader Holstein Kiel. However, the apparent €10m release clause to lure Anfangcould scared the Billy Goats. So, FC Köln handed the job to Ruthenbeck until the end of the season, as the club recently announced. This move represents a big opportunity for the new coach to persuade Armin Veh – the team’s new general manager who replaced former sporting director Jörg Schmadtke – and the club’s president Steffen Schneekloth to be the right man for the job, beyond this term. For Stöger, another opportunity is coming…and a big one too. In fact, less than a week after the Austrian said goodbye to the Billy Goats, Stöger has been introduced by Borussia Dortmund CEO Hans-Joachim Watzke as the team’s new manager, following the firing of Peter Bosz. Introducing a coach which the previous team endured the worst season’s start of any side in Bundesliga history, means BVB are able to look beyond the results. Although his last FC Köln team could indicate otherwise, Stöger built a reputation about defensive stability – as pointed earlier. So, he could restore a Dortmund’s backline that faced many troubles under Bosz, whose approach was focused on possession football and a high backline. Defenders not suited to play that way and Dortmund’s troubles facing aggressive counters caused the experiment to fail. The fact the Austrian signed a contract just until the end of this season, leaving Watzke free to pursue another coach next summer (Hoffenheim’s Julian Nagelsmann? ), means nothing: it remains a great opportunity for Stöger to prove himself and maybe get another high-profile job after this. That said, nobody can argue how remarkable Stöger’s start with Dortmund as the former FC Köln’s boss made two out of three games. A loss against Bayern – in the German Cup – aside, Stöger’s BVB seemed improved, showing a pragmatism that was unknown under the previous regime. This has been clearly evident in the games against Mainz and Nagelsmann’s Hoffenheim in which Stöger revitalized Julian Weigl who looked sharper and more involved into his team ball circulation, benefiting from a less advanced position than the one where he played under Bosz. 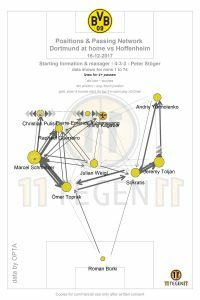 The @11tegen’s pass map of BVB game against Bayern shows how Weigl is involved in Stöger’s game plan. Glimpses of the 51-year-old’s approach have been seen especially on the defensive side of the ball where Stöger will have to put emphasis as Dortmund allowed as many as 21 goals in the eight previous league games. BVB’s 2-0 win over Mainz was the team’s first clean sheet in 10 games in all tournaments combined. The Black and Yellows employed a more pragmatic approach in which they had calmer moments that helped Dortmund to not run out of gas around the 60th minute as it happened under the previous manager. The @11tegen’s pass map highlights BVB’s positioning and passing network against Hoffenheim. In general, Stöger inserted a more pragmatic approach than Bosz, adjusting his thoughts to the players rather than the opposite as the Dutch did. The fact the Austrian lined up two kids in the starting line up – Alexander Isak and Jadon Sancho – means a lot about the fresh breath FC Köln’s former manager is looking for. It wasn’t enough to secure the three points as BVB were held 0-0 by Wolfsburg in the first game after the winter break. The new coach is also relying on Mario Gotze with the hope that the 28-year-old midfielder could stay healthy. Though whether Stöger’s adjustments will work on a long-term remains to be seen. Above all, Stöger will have to handle the issue concerning leading scorer Pierre-Emerick Aubameyang, as the Gabon striker has been left out from their squad for “disciplinary reasons” for the third time in one year.